Armenia played an “election” game, said vice speaker of the Azerbaijani parliament, Bahar Muradova, AzVision.az reports citing Trend. She was commenting on the early parliamentary election held in Armenia Dec. 9. Muradova noted that all steps were taken in Armenia so that this election brings the desired result, individuals and organizations that could prevent this were isolated, and citizens were sufficiently intimidated. 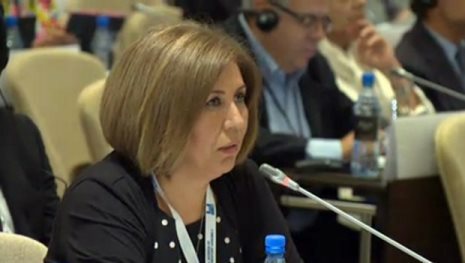 She added that various centers, international organizations evaluating the election results, including the OSCE, should demonstrate an objective position on the extraordinary parliamentary election in Armenia. “They should express their objective attitude towards this election, accompanied by appeals full of pressure and threats,” she said. Muradova also said she doesn’t think that there will be serious changes in the settlement of the Armenia-Azerbaijan Nagorno-Karabakh conflict after this election, as many experts also believe. On Dec. 9, by the end of voting, the final voter turnout in the early parliamentary election in Armenia was only 48.63 percent, according to the Central Election Commission (CEC) of Armenia. For the first time, the majority of voters in Armenia ignored the election.